Did you ever offer advice to another customer at a garden center? I'm not talking about working at a garden center or nursery and giving advice, I'm talking about being a customer and offering advice to another customer. Today I was at a greenhouse and the woman in line behind me had two one-gallon containers of Evening Primrose, Oenothera speciosa. I said quietly, "that's a spreader so you probably only need one container of it". 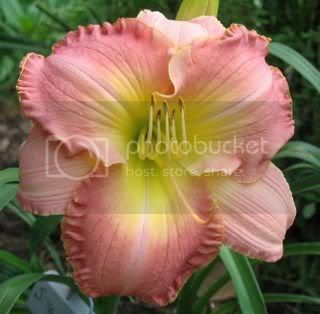 I also volunteered that after the first big bloom in spring, she should shear it back and then she'll get some repeat blooms through the season, but it won't be as prolific as the first blooms. She seemed a bit disappointed because she was looking for a perennial to put around her mailbox that would bloom all-out, all season. She ended up putting both of them back. I hope the greenhouse people didn't notice our little conversation and the result. But gardener-to-gardener, sometimes you have to speak out when you see that someone is about to make a mistake or spend money on plants that, when you get right down to it, are somewhat weedy or invasive, like Evening Primrose. I think it has a place and is a pretty pink delicate flower in the spring, but it wasn't what this woman really wanted after I told her about it. I think I've finished shopping for plants for awhile, at least for a few days. After visiting one big box store and four independents today, I've got enough plants now that I can start planting containers. If I run out of anything, I've picked out one greenhouse I'll go back to, where I ended up buying most of my plants. Regardless of "needing" any more plants, I'm going back there on Friday because the owner told me she would be all stocked up by then for Mother's Day weekend. And so I move on to planting as I reach mid-week. Right on schedule. 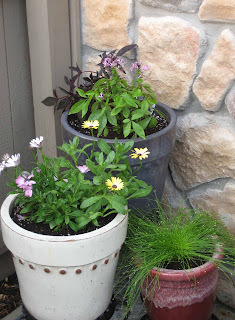 The picture above is of some of the containers I planted for my younger sister. She doesn't garden. She says she got her green thumb from my mother, who also doesn't garden. For the last several years, I've planted her containers for her as I am faster and surer with a trowel than she is. In past years, she went with me to buy her plants, but this year she left it up to me to get whatever I thought she would like. So as I went shopping for my own plants, I got plants for her, tough drought-resistant annuals that would live in containers and put up with full sun for most of the hot afternoon. And then lickety split, "we" got them all planted this evening. She's all set. Most of what I got her won't even need to be dead headed, just watered. Tomorrow, I'll start on my own containers. And as I do so, I'm eagerly awaiting the next Garden Blogger's Bloom Day on May 15th, just one more week. The idea behind this one day a month is for all garden bloggers to post on their blogs what is blooming in their garden on the 15th, and then leave a comment here on my post for that day, so we can all go to the different blogs and see who has what blooming. Based on the comments for the last bloom day on April 15th, I would guess around 50 bloggers participated. From bloom day, I've learned that it takes a long time for spring to reach some of the northern garden bloggers. But by May I'd hope that everyone has a lot blooming. Here's a peak at something just starting to bloom in my garden, the first Spidewort, Tradescantia virginiana. I've got some other flowers and shrubs just starting to bloom, but I'm going to hold back posting pictures of them as buds and single blooms now and wait until May 15th to hopefully show them in full, glorious May bloom, so you can see why May is such a great month to garden around here. I did that just the other day. I was walking into Home Depot through the garden center to pick up some lawn and leaf bags and I heard the woman behind me say to the clerk, "Do you know what kind of tree this is? You have it growing out by the parking lot." I turned and saw her waving a stem in her hand. The clerk gave hemmed and hawed and spit out a couple of possibilities, both wrong. I butted in. "That's a red oak. It's a native plant and you can buy them at Barton Springs Nursery." The clerk jumped into action. "Oh. A red oak. Yeah, we have some." Turning to me with a glower. "She can buy them here." 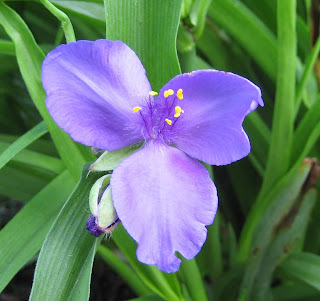 I love Tradescantia virginiana. Some people think it too unruly, and don't like its flowers' tendency to fall apart each day by mid-afternoon. My own experience has shown me how to solve each problem. I planted it by a tree. It got morning sun, and then shade from about noon until 4:00 PM. The flowers reliably lasted into the evening. After the plant got floppy and ratty, and its flowering almost ended, in mid-summer, I cut it down to a few fresh basal leaves. It came back neat and healthy, and even flowered again quite strongly. Yes, I've given advice a few times. I'd overhear someone asking the person they were with and they didn't know. I'm always kind of careful about butting in, but when someone obviously needs help and I know the answer, I do, because I'd want someone to do the same for me. We gardeners are all in this together, so it's okay to help each other out! I would like to know what plants you got for your sister's container(s), as I am thinking about a container garden with similar requirements. Carol, The planters you did for your sister are very nice. What is the green grass in the planter called? Yes, I've volunteered information to others, especially when I hear them asking for those tiresome hybrid tea or other finicky roses. They don't do well here, and most nurseries don't carry many of them, or do carry them with the caveat that they need a LOT of care to survive a nova scotian winter. I also have corrected people at bigbox 'garden centres', where I lurk from time to time to see what's happening. And (eek) I'm such a regular fixture at some nurseries that the staff will often point people to ME when I'm shopping! Well, if I can help, i do...but I don't know everything, not by a long shot and I stress that! M. Sinclair-Stevens...I wonder if that customer left and went to the nursery? dwpettili...I agree that Tradescantia does have some bad habits, but I think it is worth the time to manage it a bit. You've provided some good tips on how to do that. Kylee... I agree, it is okay to help when someone clearly has questions and you know the answer, and there is no staff around who can help. Alyssa... Sounds like "plant it forward" or share what we know! Kathy... In the picture above are sweet potato vine and a dwarf dark purple flowering cleome in the top pot. Three colors of Osteosperum are in the next pot and that is "Fiber Optic Grass" in the other pot. I also planted some Lantana and a few Wave petunias. Yolanda Elizabet... Good job on the advice. I especially hate to waste money on plants that are easily grown from seed, or are good passalong plants, if they just knew another gardener. And I'd gladly help you plant up more containers, but I'm busy with my own now! Robin... The grass is called Fiber Optic Grass, and it is a Proven Winner brand. Jodi,... Your own personal campaign to get people to buy roses they can actually be successful with. Good job! Thanks all for the comments and now I need to get back out to the garden. I have containers to plant up! That's actually how I got my last part time job! The staff heard me yakking about plants and said "You should work here!" And, so I did...for two years...that was enough. Last weekend, I was standing in one of the gift shops at Mt Vernon waiting on some girls to finish looking at the seeds (no room) when one of them turned to me and said, "You look like you know about plants." (????!) And, then asked me some rather basic questions...which I was happy to answer...it gave me a chuckle, though. I was happy to see the spiderwort advice. Some just appeared in my garden and I was a bit worried. I will have to take that advice and give it a go. I enjoy chatting with folks about plants and have had some fine conversations while waiting in line! I could have used you in the queue many years ago, when I bought my first strawberries!